This is right where he dropped. I shot at about 8:00, and sundown was 8:02 which means shooting hours close at 8:32. Barely enough light for some quick photos. Close-up of the tusks. This particular boar had very long lowers, and worn away uppers. Kind of backwards from what I have usually seen. But as always, they are worn to sharp shearing edges, perfectly meshed together like a pair of clippers. 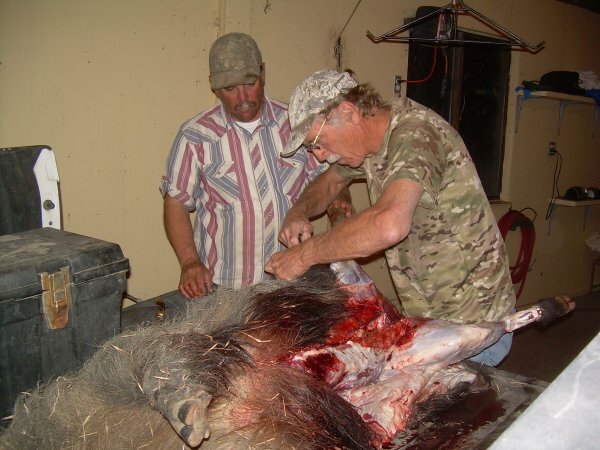 Back at the skinning and cooling shed, guide-in-training goes to work on the carcass, while Frank supervises his work. In 2017 we returned to hunt the Jack Ranch near Cholame. I hunted with friends Mark and his son Kyle. This year I decided to go with my .257 Roberts Ackley Improved. I have recently replaced the old 4X scope that has been on it for many years, with a new Leupold 3x9 VII variable, which I pulled off of a .243 that I seldom use. My eyes aren't what they once were, so maybe it is time for me to give in and try some added view power. Our hunt started on Friday evening as usual. I kind of got the royal treatment as far as guides go. Since there were three of us, and father/son naturally want to hunt together, I had a pair of guides dedicated to my hunt. Lead guide was Frank, who I have hunted with before and always enjoyed his skills and his company. Also along was guide-in-training Dave, who is learning the ropes from the veterans. We hunted and glassed a few locations while the sun was still working its way down, and we saw a few pigs which we watched for plenty of time. Opportunity did not provide on those, so as the sun reached prime time and the hills were in full shadow, we headed toward known ambush areas. We wait, and we wait, and it always seems like nothing will happen. Been there, done that, and have learned that you have to pack your patience. Just as the shadows are getting deep, right at 8 o'clock, suddenly we spot pigs heading down the western hillside toward us. And almost instantly we see another group on southern hillside, also heading straight for us. Somewhere in there, Dave called us to say he had pigs in front of him as well, where he was stationed toward the east of us, closer to the valley crops. Almost as if a switch had been thrown, we suddenly have pigs on 3 sides of us, and have to make a flash decision. This is where your experienced guide earns his pay. Frank looked quickly at as many pigs as he could. The group to the south was the closest, and as we glassed them, one good sized boar was rubbing himself against the trunk of a gnarly old oak tree. We could hear his hide scratching on the bark of the trunk. As he scratched, it obviously felt good, and he was curling his lips up in apparent ecstasy. That's when Frank saw the gleaming tusks and whispered, "that is the one we want." 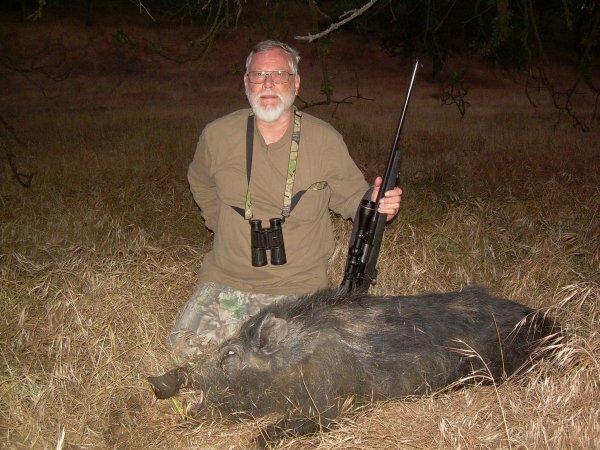 I'm a meat hunter when it comes to pigs, and I don't go out of my way to shoot big teeth, but Frank loves finding the big tuskers for his clients. So now we are kind of rushed to take a shot. We are on one side of a small dry wash bed, pigs are on the other, and slightly below us. The grass, extra tall after the excellent rains we had this winter, caused me to have to work at finding a position high enough for a clean shot. Wasting critical time left before the pigs get nervous and run. We're moving slow and talking fast, making sure we are on the right pig and have a clear shot, as I set my rifle on the sticks and let the shot fly. 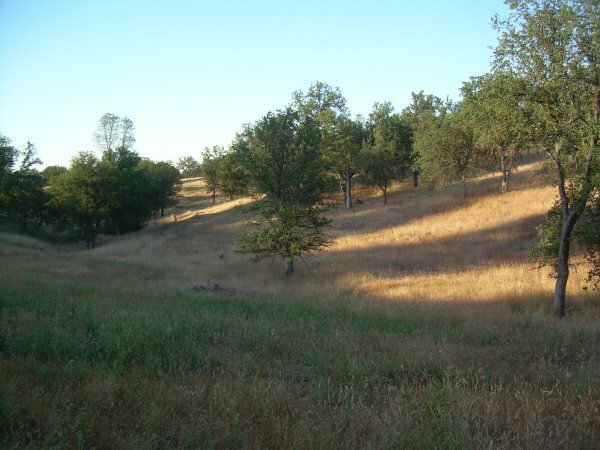 It was a hit, but the pig disappeared between the oaks and brush, and we really could not tell where he went. We crossed the dry creek, rifles at the ready for a wounded boar. As soon as we crossed, Frank immediately started following along the dry wash, because he knows a wounded pig is likely going to race toward that brushy cover. Meanwhile I crossed and headed toward the point of impact, hoping that the pig had not gone far. As luck would have it I walked right up on the pig and it was stone dead. My shot was a little lower than preferred, but that meant it had clipped the heart. In my experience, heart shot game will often get a burst of speed, and then drop in a heap, and this is exactly what happened. Looked like he had raced in a small circle around a tree and then piled up fully expired. 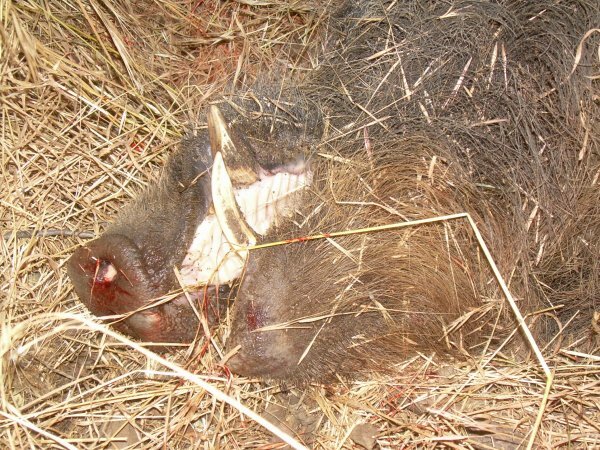 The guides were very happy at taking a boar with impressive tusks. These shots were taken the next morning on the ranch. 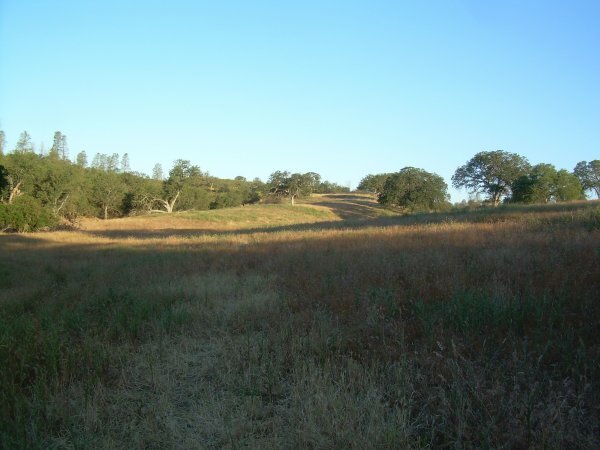 It is beautiful rolling hills studded with oak trees, and abundant game. Mark and Kyle both got their pigs as well. Kyle dropped his pig early on Saturday morning, and as we were filling out the tag for his pig, another boar charged out nearby and Mark dropped it with an excellent running shot. Within 15 minutes we had these two additional pigs down.